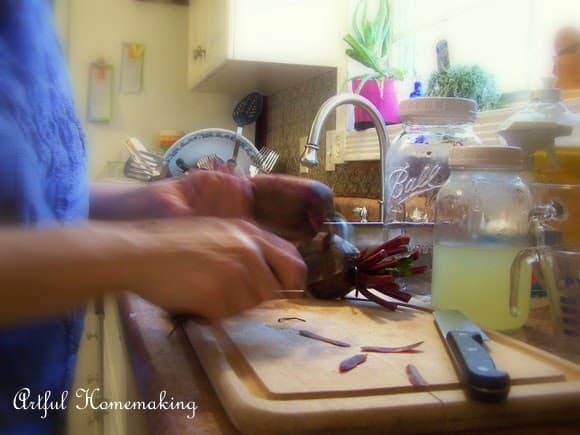 This past summer I started making Beet Kvass for my husband, hoping it would bring healing for some health issues he was having. I had made it before, several years ago, but it wasn’t a huge hit at our house! 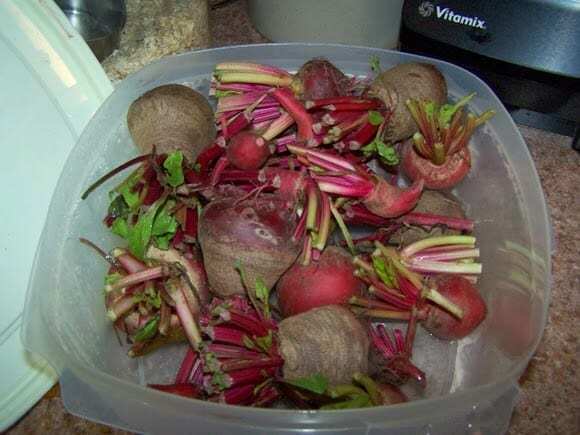 My parents were growing organic beets in their garden, so it cost virtually nothing to make it. It’s so pretty, but the taste…some people like it and some people–not so much. 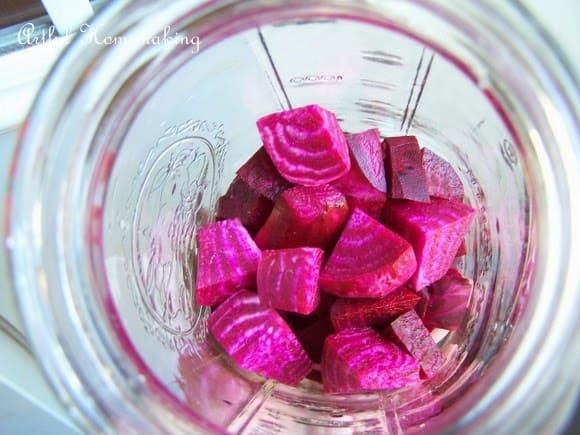 🙂 Are there any other Beet Kvass drinkers out there? 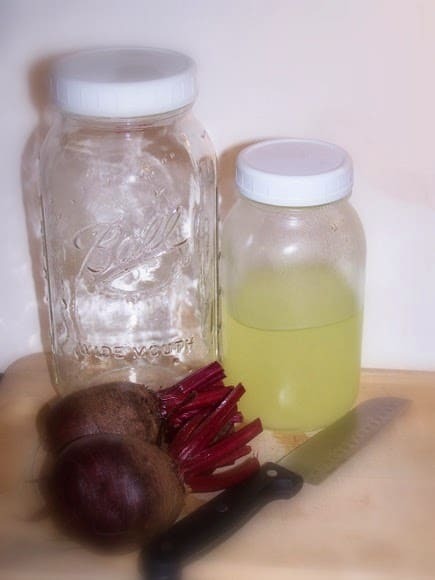 I have seen the beet kvass in my Nourishing Traditions book, but haven't had the guts to try it! Have you tried it? I'm not exactly sure what all the Paleo diet includes. I've heard a lot about that, but haven't really looked into it. We have mostly been following a Nourishing Traditions/Maker's Diet approach as much as possible (and Jordan Rubin's "Restoring Your Digestive Health" book). I think there may be some similarities between the two ways of eating, but I'm not sure. Although Nourishing Traditions really stresses fewer grains and soaking the ones you do eat, we've been lately looking into possibly cutting out even more. We recently got a book about cooking with almond flour, and we've made a few things from it, which we thought were very successful. Thanks for mentioning the Paleo Diet, though, I'll have to check it out! Yes, I was so thankful for my Dad's foresight! When I told him the hard drive was making a clicking noise, he said that was a bad sign. He does know a lot about computers, but he was especially concerned, because the same thing recently happened to my mom's computer, and she lost everything. I'm very glad to have my computer back and working better than it did before! We aren't sure if it has given any health benefits, since we also started doing quite a few other things at the same time (making viili yogurt, kombucha, etc.). Nourishing Traditions makes quite a few health claims about it, though. 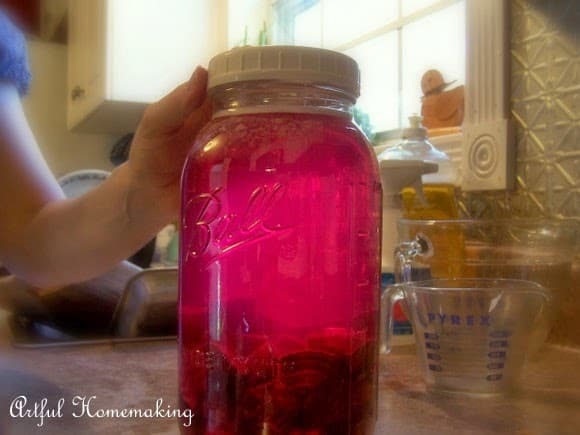 I have read about beet kvass and have wanted to try it, but haven't made the dive into trying yet. It does seem pretty simple to make-thanks for the post. Has it helped with health benefits? I have never heard of beet kvass but am off to look it up! Glad your dad has repaired your computer! I have never even heard of this before, Joy. You're right, though, it is really pretty! The days when our technology fails us, is a scary one! Tell me Joy, has your husband tried the Paleo Diet? It is known to work and help so many of us with so many health problems.